Firstly I�m puzzled by the cover of this disc - why the bathing huts? Secondly, the CD sleeve says that they are legendary masterpieces and also legendary performers BUT these are not Legendary performances! 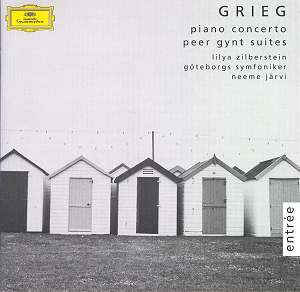 The Greig piano concerto is an old fave of mine which I try not to play too often. I remember being transfixed by Lipatti�s brave performance on LP many years ago and the CD is readily available. Sadly the version by Eric Morecambe and �Mr Preview� seems unavailable but there are many fine versions by luminaries like Stephen Kovacevich and Clifford Curzon. If you don�t know the piece don�t get this as your first. It�s not bad but it lacks tension and despite good playing the performance doesn�t catch fire. All the notes are in place and in the right order but there are no thrills. Neeme Järvi conducts competently but the Orchestra don�t sound fully engaged. The highlight is the Two Nordic Melodies, especially the second which would work well at the "Last Night of Proms" but I�m not sure how often I want to hear them. In the Peer Gynt suites Morning sounds perfunctory, rather as if they�d played it too often. My son called it "an honest reading". I really like these works and Beecham�s recording, now on GROC EMI 669662 is a favourite. I really think you should get this! The suites are played well generally and the Gothenburg Symphony Orchestra is clearly a fine band. In the famous In the Hall of the Mountain King I felt it all a bit plodding at the beginning as it we were being told "it�s goin� to get faster"! The climax is held back and there�s no Beecham "let it rip". This looked like a good collection when I spotted it in the sales rack a few weeks back but it�s a mixed affair with only the "Two Nordic Melodies" approaching top class. I dare say it will suffice as background but it lacks magic! And no, I still don�t know why the beach huts are there!